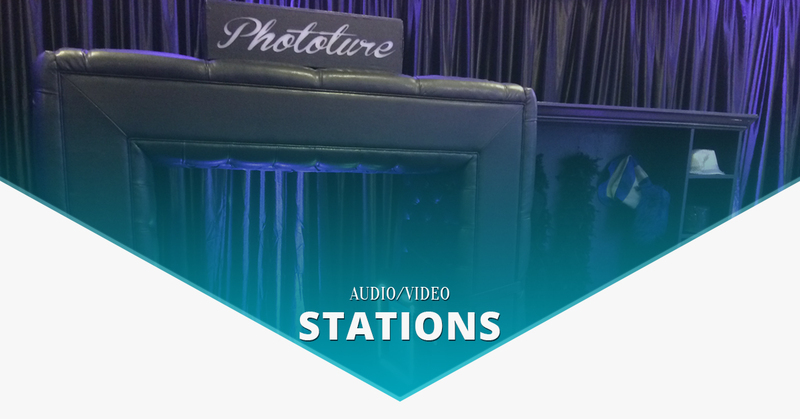 Audio Video Stations In Midtown - Event Design That Will Make Memories | Creative Games Inc. Since video killed the radio star, it’s been all about the unstoppable audio/video combo, and your event’s entertainment should be no different. Through pure innovation and tenacious energy Creative Games has created various entertainments that are sure to baffle and please your guests for the entire length of your event. Our vision with each amenity came together with an impressive fluidity that shows in the set-up and production of each service. 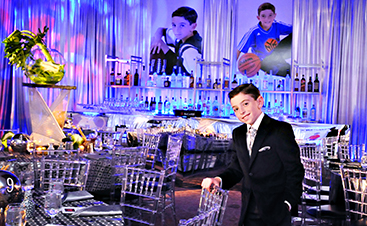 When you plan an event with Creative Games, whether it’s a wedding, bar mitzvah or a corporate party, we’re here to encourage and foster your creativity. All of the below event planning selections are merely templates that area created to be flexible enough to both fit your needs and your personality so that the event is an extension of you. As one of our favorite services we provide, this selection shows our most creative and unique ideas to the forefront. 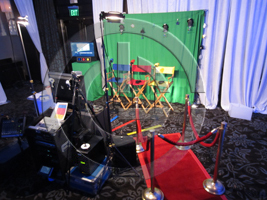 From Karoke Movies to the Video Confessional Booth the Audio Video service packages are some of our most unique selection of amenities the we can provide. This package of services is unique in that it nearly guarantees a perfect snapshot of the event in the form of a auditory and visual representation of the event. In one swoop you’ll have immortalized the experience, and the exact way you and your guests experienced life at this point in time. Going big on an event in Hell’s Kitchen seems only natural, doesn’t it? Browse our wide selection of other amenities that you and your guests can enjoy at your upcoming event. We can provide food concessions that can be ultra- personalized from a special 7-11 with a smoothie machine all the way down to a fully outfitted candy shop, dripping in sugary goodness. Going big? 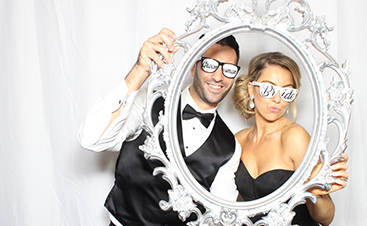 Shop our storage options so your guests can stow away their accessories and go to enjoy a number of the entertainments you’ve scheduled to ensure your event is unforgettable like a unique performer or artist and a completely unique photobooth that suits your theme. Have some ideas about what your event can be? 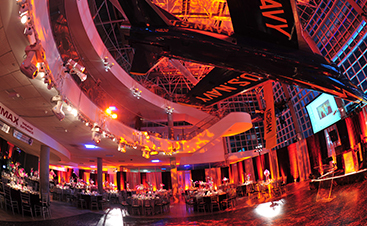 Use our ideas as a springboard and try to come up with event entertainment and planning that will knock your guest’s socks off because it’s completely your own. We’ll turn your passing fancies into reality. Any concept for the confessional booth can be designed based off of your theme. 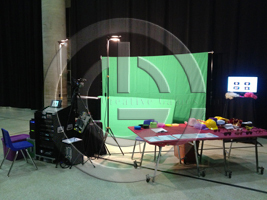 The presentations from individuals typically become a time drain on your party and they often are produced for safekeeping after an unprofessional video edit. 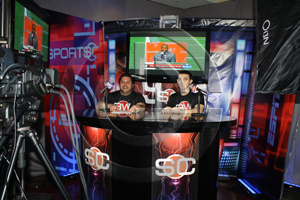 Our booth removes both scenarios and creates a lasting memory for the rest of your child’s life. A Video DVD will be mailed one week after the event. Can handle approximately ten to fifteen performances per hour at up to 5 guests at once. Requires: 12′ x 15′ Area and 20 Amp Circuit. Did you ever think to yourself, "I could say those lines better," or "I could have written a funnier line then that." Here's your chance: record or “dub” your own voice over scenes from Hollywood movies. You and your guests can try to match the cut exactly or change it up a bit. Do scenes with multiple characters or monologues. It’s perfect for the movie buff or the aspiring impressionist. Can handle approximately ten to fifteen performances an hour of up to 3 guests at a time. Includes personalized labels at no additional fee, three attendants and unlimited DVD’s to record on. Requires: 12′ x 15′ Area, 20 Amp Circuit and a 6′ table. 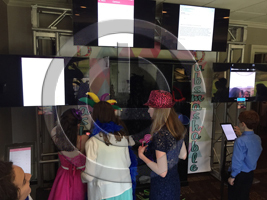 Four iPads will be hooked-up to large plasma screens and tuned to the Video Star App. 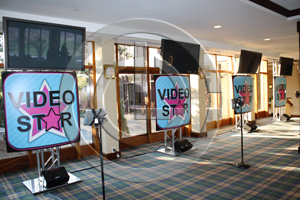 Your and your guests can choose from up to twelve different songs and shoot your very own video with props and director at the station. Once finished and edited, we will e-mail the videos to each individual. Requires: 15′ x 15′ Area and two 20 Amp Circuits. It’s fun and easy to star in your own music video toons with your guests. Choose your favorite song, put on a smile and bob your head to the beat. Each song can be done with individually or up to three people. Requires: 10′ x 12′ Area, two 20 Amp Circuits and a 6′ table with two chairs. Freestanding dome shaped kiosk where a virtual character floats inside and interacts with you and your guests. Characters can vary depending on the theme of your event. Choose from a genie, a Mr. Know-It-All, a shopping maven, sports fanatic and more. Requires: 8′ x 8′ Area with a separate 10′ x 10′ and two 20 Amp Circuits. Now is your chance to become a Hip Hop DJ. 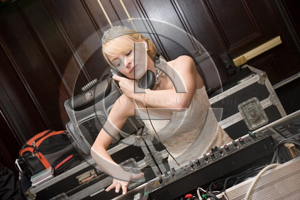 Our expert DJ will teach you and your guests how to scratch records. Requires: 12′ x 15′ Area, an 20 Amp Circuit and a 6′ table.